While there’s nothing particularly Mexican about these tea cakes, they’re an international favorite for good reason. I’ve always heard these cookies called Russian Tea Cakes, and they mostly seem to be made by older eastern European women at bake sales and Christmas fairs. As children, these were the cookies that we ignored on the big cookie platter, preferring the triple chocolate and jam puddle options. Conveniently the adults in the room weren’t too interested in those ultra sweet and sticky confections, and seemed to prefer the tea cakes. I didn’t get it, the nuts made them taste suspiciously healthy, and they were far too dry. Now nut based cookies are some of my favorites, and I realize what a joy dry cookies are with tea or coffee. The cookies take a little bit of forethought, but they’re well worth it. You start by making the dough (cream together butter and confectioners sugar, add vanilla, flour, finely chopped pecans, and salt, mix until just combined), and refrigerating it for 6 hours. You then roll the dough into balls, and bake. 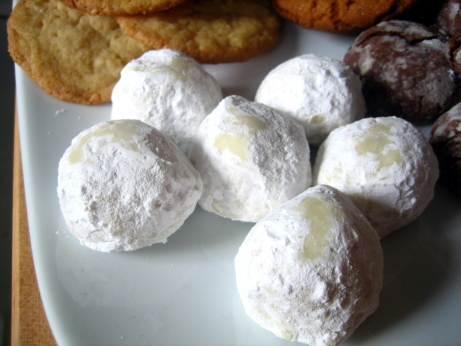 The hot cookies go directly from the baking sheet to a bowl of confectioners sugar. The heat of the cookies melts the sugar and ices them for you. Once the cookies have had a chance to cool they go back to the sugar bowl to get a final layer of powdered sugar. By far the best thing about these cookies is that they keep forever. The recipe says they keep at room temperature for up to three weeks, but I kept mine for more than a month and the last one was almost as good as the first. The pecans are both the prominent flavour and texture of these cookies, and that’s a very good thing. They’re quite dry and a bit crumbly, but their sugar coating keeps them from completely drying out or becoming brittle. Before making this recipe I’d never realized how cookies like this got so evenly glazed, the hot cookies in sugar method was a real revelation for me. I’m adding these cookies to my repertoire. They’re delicious but not at all showy, can be made well in advance, they work year round, and they fill out a cookie tray nicely. Having cookies like these in your arsenal is a very smart move. I’ve heard of these called “Mexican Wedding Cakes,” btw. And now I want some. Thanks! I’d like to collect every name there is for these cookies, I think I like wedding cakes better than tea cakes. Sometimes Mom didn’t roll them in confectioner’s sugar and they were still good. Sorry about the late comment but I just now discovered your blog. Great, add Swedish Wedding Cookies to the list. I’m sure they’d be good without the roll in sugar, and I guess it is a little fussy to do it, but I’m convinced it’s worth it. Sorry about the late reply, I was away at a beach house that was supposed to have internet access, but didn’t. Nothing puts people in the mood for cookies like a divorce. Nut kisses, I like that.